I love a good Greek salad, don’t you? One of my favorite memories when traveling in Greece YEARS ago (we’re talking pre-kid travels here) is consuming as many Greek salads as possible. Fresh cucumbers, summer-ripe tomatoes, melt in your mouth olives and creamy feta. There’s something missing, right? The leafy green. It was at that point I realized a true Greek salad contains no leafy green. This love of Greek salad, coupled with a favorite memory makes me wonder: why don’t I ever make a Greek salad at home? It is a simple combination, healthy and de-licious. Stateside we are used to the addition of the leafy green and a protein. It is a much more filling creation and can be served for more than just a side dish.Creating a stateside Greek salad at home is easy. Pop over to Market Street and fill your cart with fresh, organic produce, cheese and condiments. Once home combine those beautiful cucumbers, tomatoes, olives, feta and romaine with extra-virgin olive oil, red wine vinegar and the quintessential Greek herb, oregano. You could stop there and be perfectly content, however, if you’re like me when shopping at Market Street, item after item calls your name and ends up in the basket ready to be taken home. That’s how I ended up with shrimp (they were on sale that day and the fish monger insisted I get some for my salad!) and a beautiful new bowl from the dish department. 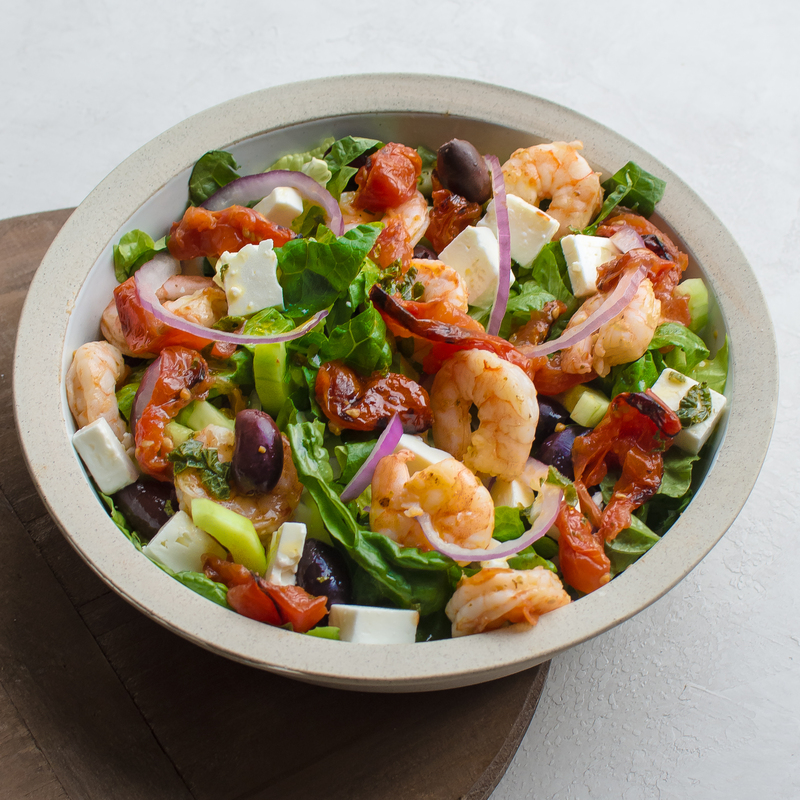 It was serendipitous because a leafy Greek salad topped with fresh shrimp in a brand new bowl kinda makes my day better. I will say, creating a Greek Salad in the winter can be a bit…dicey. You see, one of the key features to a Greek salad is tomatoes. In winter, getting a summer sweet tomato is difficult. Have no fear, I have a bit of help for that: the oven. 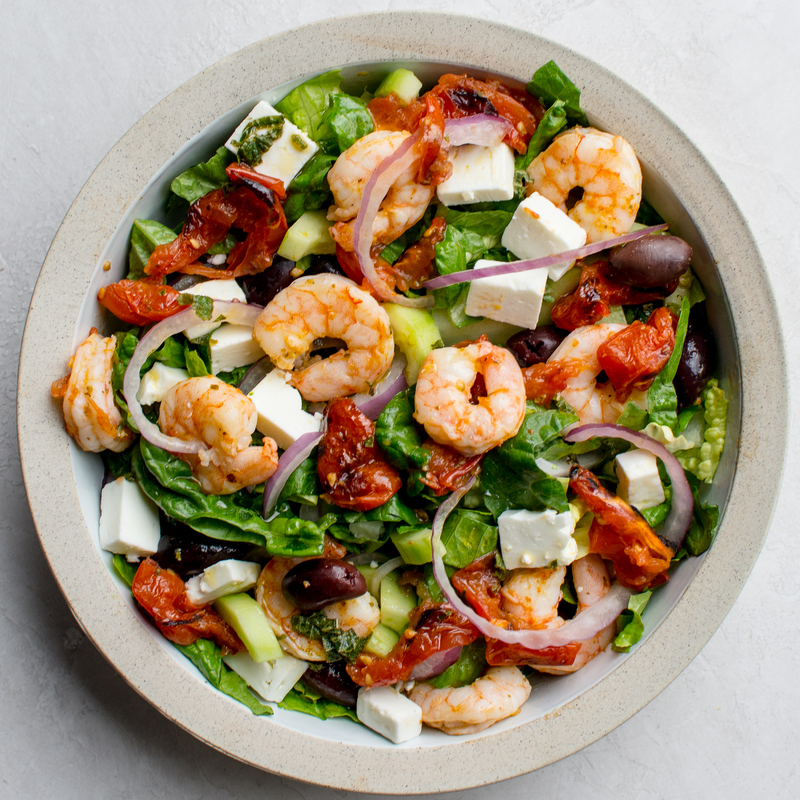 Tomatoes, when roasted, yield a delicious concentrated tomato flavor which is perfect to add to this Greek Shrimp Salad. Plus, all those leftover tomato juices that are extracted from the roasting process are used in a tomato vinaigrette to top the salad. Enjoying this salad should be on your winter must-do list. Then, once summer hits and every single tomato at Market Street is calling your name (as they always do) make this salad again (without roasting the tomatoes) and think of a summer holiday on the Greek Islands. 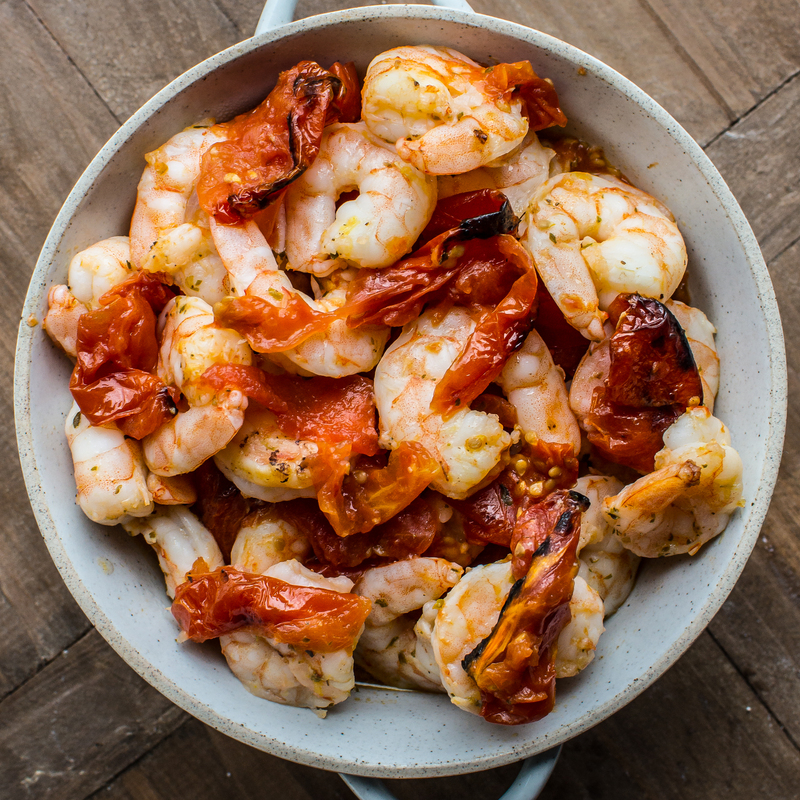 Place the shrimp, 3/4 teaspoon kosher salt, 1/2 teaspoon oregano, lemon zest and 2 tablespoons olive oil into a bowl. Stir well. Set aside. 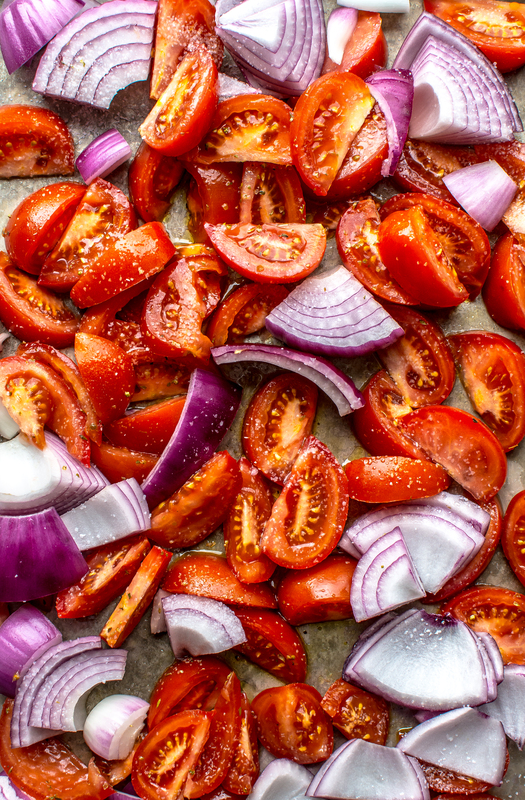 Place the tomatoes and 1 onion into a bowl. Toss with 1 teaspoon kosher salt, 2 tablespoons olive oil and 1/2 teaspoon oregano. Pour the mixture onto a rimmed baking sheet. Place into the oven and roast for 35-40 minutes. To achieve a char on the vegetables, broil the mixture for the last 3-5 minutes of roasting. Remove the vegetable mixture from the oven. Carefully pour the juices into a small bowl. Add 1/3 cup olive oil to the pan juices. Stir to combine and let cool for 10 minutes. Place the shrimp in one layer onto the sheet pan. Place back into the oven and cook for 8-10 minutes, or until the shrimp is pink and cooked through. Remove the sheet pan from the oven and let the shrimp cool for 10 minutes. Meanwhile In a small bowl combine the lemon juice, vinegar, mint and a pinch of salt. In a steady stream add the pan juices to the mixture, whisking continually. 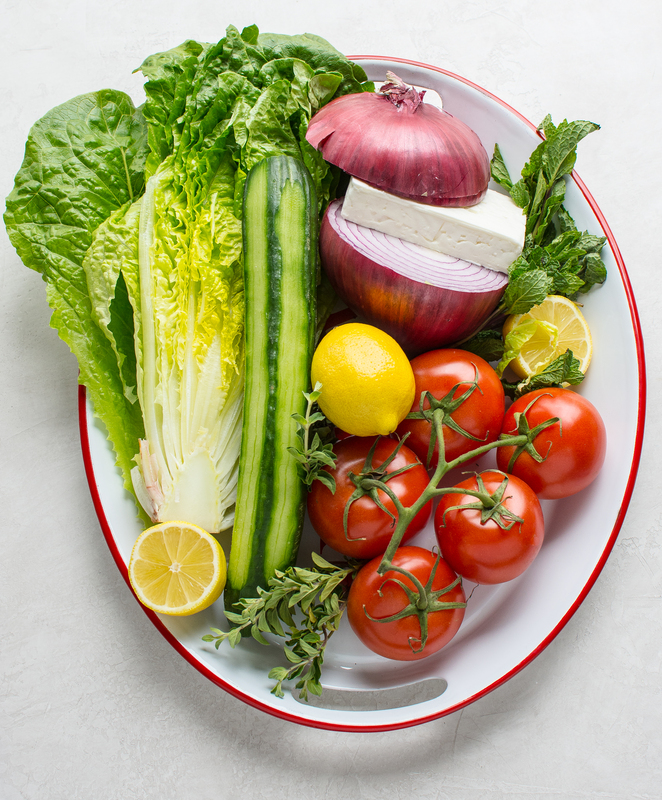 Place the lettuce, sliced red onions, cucumbers, cheese and olives into a large serving bowl. 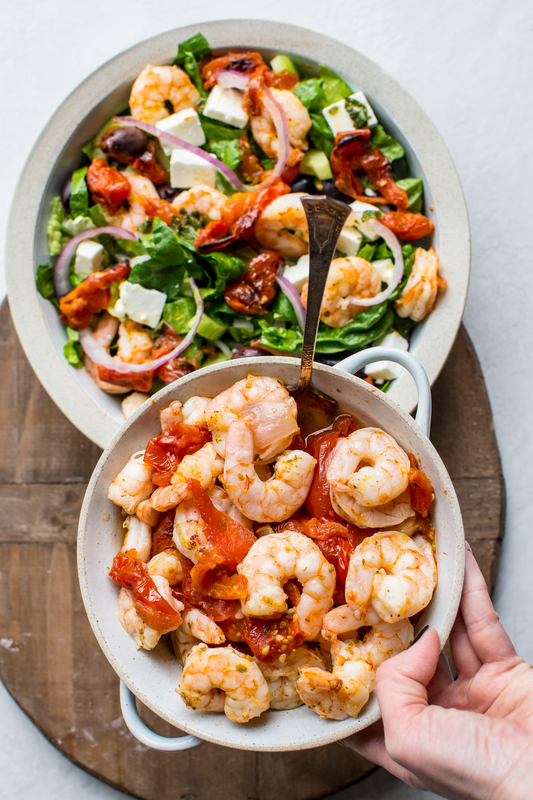 Toss the salad with the vinaigrette (to taste) and shrimp. Serve immediately or chilled. This entry was tagged a pleasant little kitchen greek shrimp salad, A Pleasant Little Kitchen salad, dallas food blog, dallas food blogger, greek salad, greek shrimp, greek shrimp salad, texas food blog, texas food blogger. Bookmark the permalink.